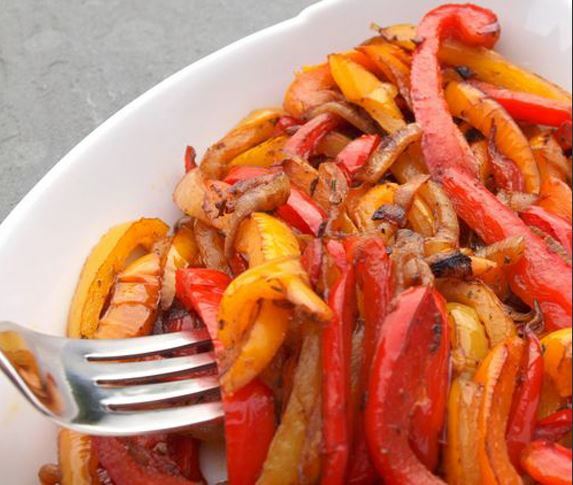 Eaten raw, bell peppers are sweet and crunchy yet when cooked, they become tender, luscious and – in this case – ever so slightly charred. The same goes for the onions, which start off sharp and pungent, but transform into sweet caramel-colored ribbons. FREEZE: This dish freezes well. Prepare double the amount and freeze. Heat the oil in a large skillet over medium-high heat. Add the onions, peppers, 1/4 teaspoon salt and 1/4 teaspoon pepper. Cook, stirring every few minutes, until onions are caramelized and peppers are tender and slightly browned, about 15 - 20 minutes. Add balsamic vinegar and thyme and turn heat to low. Cook for a few more minutes. Taste and add remaining salt and pepper if desired. Serve hot or at room temperature. Alice: One of the BEST KEPT SECRETS in the Kitchen! Alice: You've Never Eaten Cottage Cheese Like This! Guest: Cook your way out of the 10 Worst Kitchen mistakes! Alice: Tomato Jackpot—Also Known as PANZANELLA! Alice: Taking Corn-on-the-Cob Eating to a Whole New Level!